Search Paul Gorski's Winnebago County News! Rockford, Ill. – The Rockford IceHogs announced on Friday that "Winning Weekdays," is returning for the 2017-18 season, presented by Fas Fuel (Fas Mart® convenience stores). Each time the IceHogs win at home on a Monday, Tuesday or Wednesday, every fan in attendance may redeem their ticket at the BMO Harris Bank Center Box Office for a free ticket of equal or lesser value to the next weekday home game. 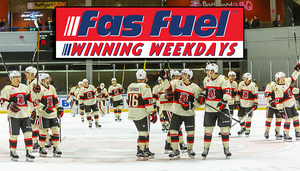 Fas Fuel will also be giving away one $50 gift card during each weekday game. To redeem a Winning Weekday ticket, fans can visit the box office following the game, or during regular box office hours prior to the next weekday home game. The BMO box office is open Monday-Friday from 9 a.m. to 5 p.m. Fans are not guaranteed the same seat or section for the next game, but are welcome to sit in the same location if the requested seat is available. Regular season single game tickets go on sale on Thursday, Sept. 14. Wednesday Nov. 15 Iowa 10:30 a.m.
Wednesday, Nov. 22 Iowa 7 p.m.
Tuesday, Nov. 28 Manitoba 7 p.m.
Tuesday, Dec. 12 Chicago 7 p.m.
Tuesday, Jan. 2 Cleveland 7 p.m.
Tuesday, Jan. 23 Bakersfield 7 p.m.
Wednesday, Feb. 7 San Antonio 7 p.m.
Tuesday, Feb. 13 Cleveland 7 p.m.
Wednesday, Feb. 28 Texas 7 p.m.
Tuesday, Mar. 13 Iowa 7 p.m.
Don't miss a moment of the action by reserving your seats for the IceHogs 19th season of professional hockey and 11th as the top AHL affiliate of the Chicago Blackhawks. Opening night is Oct. 14 and ticket packages begin as low as $105 for a seven-game mini pack. Please contact us at (815) 847-6399 or visit icehogs.com to claim your spots for this upcoming season. The IceHogs events, dates, times and prices are subject to change without notice. Discounts not applicable to prior sales, subject to availability and cannot be combined with any other offer. Use of the IceHogs name, logo or any other images is prohibited without written permission from the Rockford IceHogs Professional Hockey Club. Paul Gorski's Winnebago County News. Original material is Copyright ® Paul Gorski. Columnists are entitled to Copyright on their own original content. Links are provided to various local TV, Radio and Newspaper sources, and those links may take you to additional copyrighted material. The opinions expressed here may not be (and probably are not) shared by the media outlets listed, nor do these media outlets endorse the information posted here. We do not accept advertising. We feature the news from, in no particular order: WNIJ, WREX, WIFR, MyStateline.com, and The Rock River Times, The Rockford Register Star, FarmWeekNow.com, The Rock Valley Publishing collection of newspapers, among others. Please support these news organizations. The Winnebago County News is a nonprofit, noncommercial educational news reporting venture. The links to news content outside this site are presented under the Fair Use doctrine of US Copyright law, as the links are presented for news reporting and nonprofit educational purposes. Please visit our companion sites Rockford Sports News and Rockford Weather News. Contact us at editor@winnebagocountynews.org. Follow us on Facebook and Twitter.